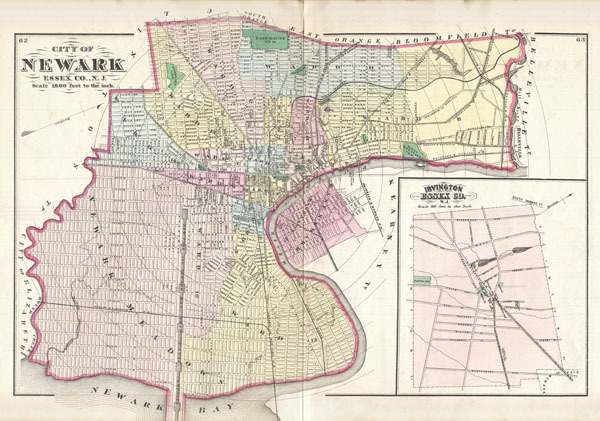 City of Newark Essex Co., N.J.
A fine example of the 1872 map of Newark, New Jersey by F. W. Beers. Covers the center of Newark from Elizabeth to Belleville and from Bloomfield to Newark Bay and the Passaic River. Shows streets, city wards, canals, parks, railways, and important buildings. Includes the 'Proposed New York and Newark Bay Ship Canal,' which though the darling of several New Jersey politicians of the period, never materialized. Concentric circles marking mileage radiate out from the center of the city at the intersection of Market and Broad Streets. Also includes adjacent East Newark. An inset map in the lower right quadrant details Irvington, Essex, Co. Published form original survey's by F. W. Beers in his 1872 Atlas of New Jersey. Beers, F. W., State atlas of New Jersey based on State Geological Survey and from additional surveys by and under the direction of F.W. Beers, 1872. Very good condition. Original centerfold. Map of Plainfield, NJ, on verso.